Giovanny Martinez, 19, from Louisiana, born in Guatemala. If you ever want to see your father, you need to start behaving and stop giving your mother a hard time. ”Yes, sir.” That’s the only conversation I remember from our trip from Guatemala to Louisiana, where we were reunited with my dad. I was six, my brother only four. We were travelling with my mom and a family friend – the travel guide who encouraged me to behave. On October 5th, my brother’s fifth birthday, we arrived in Louisiana. My dad was waiting, a cake in one hand and a gift in the other. America has always been home. As a kid, I didn’t know anything about immigration status. I just knew our family had moved to a place where the language and culture was different. It’s still home. My parents have always done their best to provide me, my brother, and now our younger sister, with the materials to succeed. They work long hours to support the family — often my dad is gone most of the day working at different jobs. He leaves early in the morning and returns late at night. He often takes side jobs at night to earn more money. My mom, on the other hand, we see a bit more. She is self-employed and cleans houses to help support our family. She knows English a bit better than my dad, because she had a scholarship to study in the U.S. as a teen. Despite the American-earned associate’s degree, she still can’t obtain a high paying job because of her immigration status. My brother and I, despite sharing a similar story, are complete opposites. We both like sports, but we’re pretty competitive with each other. I learn by reading, he learns with his hands. God blessed my little sister with a beautiful voice. She sings for our family, our church, and community events. As a first-generation college student, I must do more than my best to excel in order to help my parents, so that they won’t struggle. In middle school, my parents told me I was undocumented. It didn’t really affect me until high school – when I learned what “undocumented” really meant. Now, I work to protect my little brother from the hardship, and my little sister from the truth of her family’s situational risks. Throughout high school, I was really busy – I played football, soccer, and ran track and cross country; I was a member of student council and a member of Students 2 Students – a program that helped new students acclimate to the school; and, for a year-and-a-half, I worked 30 hours a week to help provide for my family. Junior year of high school, I started searching for scholarships. I clicked on almost anything that mentioned DACA, undocumented students, or scholarships. Then, I found TheDream.US scholarship opportunity — it changed my life. Without the scholarship, I’d likely be attending community college and working. I’d have to work long hours just to attend part time. Now, after college graduation, I hope to attend medical school and become a doctor. Then, I plan to open a clinic in Central or South America and serve the community at affordable prices to make sure everyone has access to medical care. 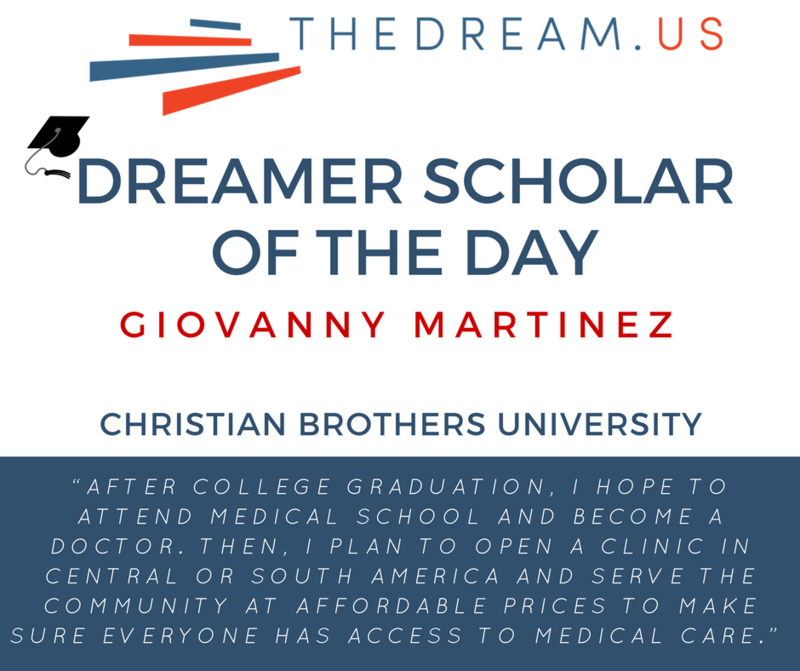 TheDream.US scholarship, and higher education access in general, give DREAMers the opportunities to contribute to our country and to show everyone what we can achieve, when given the chance.